With Bay View Resort being located right off the Myrtle Beach Boardwalk, you are able to get to so many great attractions, restaurants, shopping and events. But, if you are in the mood to wonder off the beaten path and find some other hot spots in Myrtle Beach, we have put together a list for you to try. House of Blues — The premier live-music venue at North Myrtle Beach shopping/dining/entertainment hot spot Barefoot Landing, this Mississippi Delta juke-joint inspired music hall hosts a regular schedule of national touring acts. The 59,000-square-foot venue sets the mood with a unique collection of contemporary folk art decorating its spaces, and when all that rocking gets you and your crew hungry, Southern staples such as Shrimp & Grits, Jambalaya and Baby Back Ribs can be found on the dining menu. The HoB’s summer 2018 concert lineup includes Collective Soul, Biz Markie, Yacht Rock Revue, Jimmy Eat World, Drive-By Truckers and more. Local acts are also regularly featured on the venue’s outdoor deck. For more info, visit houseofblues.com. Bourbon Street — Located next to Pine Lakes Country Club in Myrtle Beach, this North Kings Highway bar & grill/music venue is a favorite among music-loving locals. 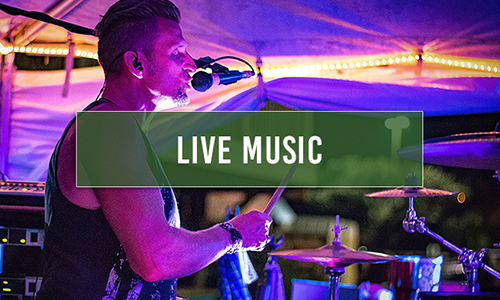 Offering a smoke-free atmosphere and serving a menu of sandwiches, tacos, quesadillas and appetizers until late in the evening, Bourbon Street offers a summer lineup that includes acts such as The Travelin’ Kine, the Brad Long Band and Little Bird. To learn more, visit bourbonstreetmb.com. The Boathouse — Boasting “the Best Backyard in Town,” this bar & grill located on the Intracoastal Waterway just off Highway 501 in Myrtle Beach is known for its free Sunday Concert Series regularly featuring “up and coming” country artists from across the region and nation, as well as rock acts, tribute bands and more. The Boathouse also offers an extensive menu highlighted by sandwiches, seafood, surf & turf items, and burgers. The venue’s summer lineup includes Riley Green, Hudson Moore, Abbey Road and Badfish — all playing in late June alone. For more information, visit boathousemb.com. As you can see, there are many options North, on the Intracoastal, in the heart of the city and on the southern end, you are sure to enjoy a new perspective and some great live music. When your evening comes to an end, head back to Bay View Resort, settle in to your home away from home and plan your next days adventure.